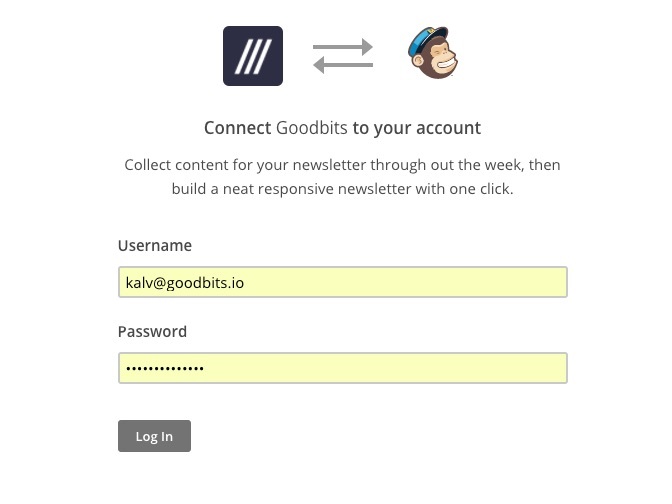 Goodbits supports sending the emails you build to any existing MailChimp List and Segment. This guide will show you how to go about this. Your subscribers are stored in MailChimp and Goodbits is used to save articles and build your emails. 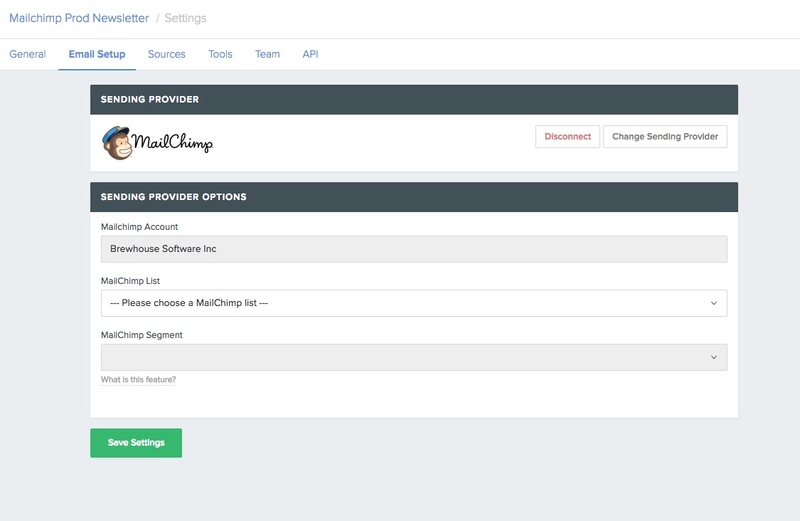 You can still use our Landing Page integration which will send the subscribers to MailChimp. All analytics are stored in MailChimp. The Goodbits Analytics page will show the analytics fetched from the campaign that is created in MailChimp. The first step is connect Goodbits with your MailChimp account. To do this simply head over to the settings of your newsletter and click "Change Sending Provider" and then select MailChimp. You should then see this screen. Click on the "Connect MailChimp Acccount" button and enter your MailChimp login details (we do not store these). You should then be re-directed back to Goodbits, where you can now pick the MailChimp List you would like to use and the segment. If you can't select any segments, this is because we didn't find any. If you expected Goodbits to show segments, please send us a message on support. When you are ready to send the email you have built in our email editor. You can click into the "Prepare to Send"
You have a couple of options here on how to send your email. You can send the email when you click on the "Send Now" button. This will create the campaign in MailChimp and tell MailChimp to send the campaign instantly. You will not have to go to your MailChimp account for any reason. Under the Date & Time section you can schedule to send this email at a later time. Goodbits will at that time perform the sending. 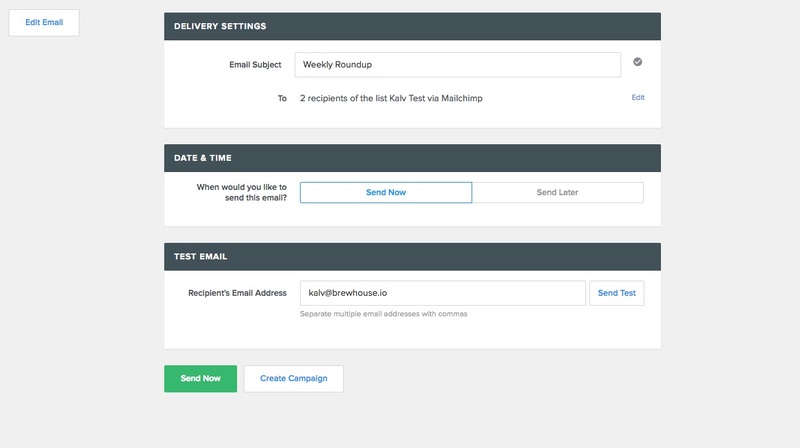 This like the send now will create the campaign in MailChimp and send it but only at the time you have configured. You can cancel this if you would like from the emails index page. The last option is if you'd like to further customize the email in MailChimp before sending it out. To do this you can click the "Create Campaign" button which is visible next to "Send Now". That will create the campaign only in MailChimp and not send it. You can then head over to MailChimp and further send the email.